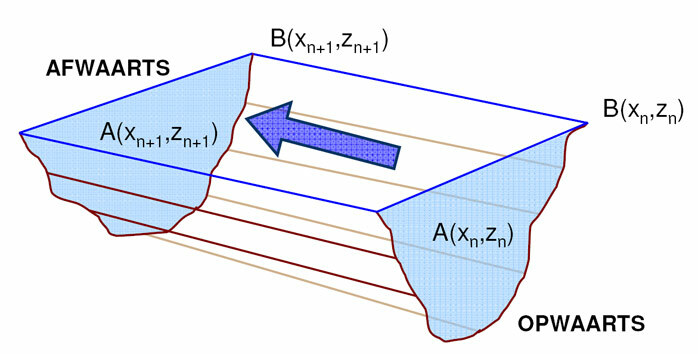 The “cubage”-technique (“kubatuur” in Dutch) is a relatively simple technique to calculate the hydrodynamics in an estuary (Smets, 1996; Plancke et aL, 2011). It requires only topo-bathymetric data and water levels at different stations to calculate discharges and cross-sectional averaged flow velocities (see Figure 3) starting from the conservation of mass formula. In contrast to numerical process models, this technique does not require any flow resistance (“roughness”) coefficients to calibrate the model. Where the cubage technique uses mass conservation (which is an exact relationship) the error of the method is solely related to the error in water level and topo-bathymetric data. Hereafter some mathematical background on this technique is given. Within the TIDE-project it was chosen to perform the cubage calculation for mean tidal conditions (only input data available for mean tidal conditions). In a first step the mean tidal parameters (HW, LW, time of rising and time of falling) were derived from measurements for the present situation for a station at the mouth, a station in the middle of the estuary, and a station at the upstream boundary of the estuary (see Table 3). Where the cubage technique requires a continuous time series of water levels, one period (or 2 periods for the Elbe and Humber) with several tidal cycles was chosen from the continuous measurements (see ‘selected tides’ Table 3) for which the low and high waters have the best agreement with the MHWL and MLWL values for the present situation for all 3 selected stations. For the Elbe and Humber 2 time periods were selected (one with low and one with high river discharge) because of the important differences in river discharge at the up-estuary boundary of these estuaries. From the selected time period, water level measurements for all tidal stations were selected as input for the cubage calculation (location of all tidal stations see Figure 9 (Scheldt), Figure 10 (Elbe), Figure 11 (Weser) and Figure 12 (Humber)) . At the up-estuarine boundaries the “cubage” technique requires the implementation of a fresh water discharge. Based on the daily values of the present situation, two characteristic fresh water discharges were calculated: P(5%) representing a “summer” condition and P(95%) representing a “winter” condition. Cubage calculations with a winter/summer condition were within this study performed for 3 of the 4 estuaries (Elbe, Weser and Humber) (see Plancke et al., 2012a,b,c). For the calculation of the high/low discharge period of the Elbe and Humber, appropriate tides were selected in the high/low discharge period with implementation of respectively the P(95%) and P(5%) freshwater discharges. For the Weser, appropriate tides were selected only during one time period of the year. The high/low discharge variation was again simulated by implementation of respectively the P(95%) and P(5%) freshwater discharges. For the Scheldt, an earlier cubage calculation with implementation of a mean freshwater discharge (P(50%)) was used (Plancke et al., 2011). Here, no distinction was thus made between winter and summer condition, due to the limited effect of the discharge on the water level. More detailed information on the cubage technique is given by Plancke et al. (2012a,b,c). In the case that the funneling of the estuary is more important than the friction in the estuary, 1/b will be positive, and tidal amplification can be expected. If friction becomes more important, 1/b will be negative and tidal damping can be expected. Data with a ratio TR/h > 0.80 were excluded from the analysis (TR =tidal range, h= averaged water depth over tidal cycle). Above this threshold, tidal damping calculations become less accurate (Savenije, 1998). 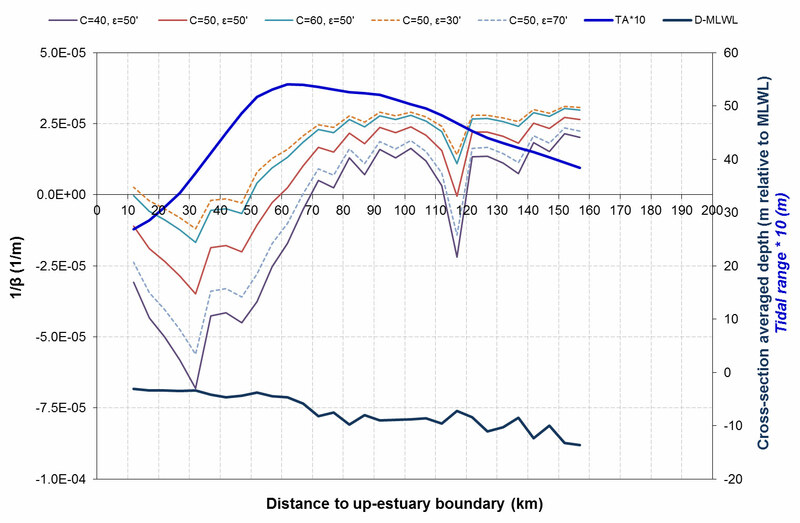 For the Scheldt, 5 data points were excluded (in total 25 km), for the Humber 11 datapoints (in total 55 km, a consequence of the shallowness of the estuary). For Elbe and Weser no data points were excluded. The slope of the relationship between ln(B) and x then returns -1/b (see Appendix A). The larger 1/b, the more convergent the estuary is. Classically, the b value is determined for the whole estuary (Savenije, 1998), however we observed some important breaks in ln(B) for 3 out of 4 estuaries (Scheldt, Elbe and Humber). The best example is the Humber-Ouse estuary where the Humber is clearly much more convergent than the Ouse tributary (see Figure A 4). When defining breaks, we assumed that estuary convergence has mainly an effect on tidal amplification/damping over a large distance along the estuary (> 20 km). Smaller, more local variations in ln(B) were not considered. The found 1/b values are listed in Table 4. For the calculation of 1/b , some of the parameters are variable along the length axis of the estuary, others or constant. An overview is given in Table 4. Tidal discharges over a tidal cycle, representative for mean tidal conditions, were calculated at every water level station (§3.1.2). For the Scheldt these tidal discharges were calculated under conditions of mean riverine discharges (see Plancke et al., 2011). For the Elbe, Weser and Humber tidal discharges were calculated under conditions of high and low riverine discharges (see Plancke et al., 2012a,b,c). If the netto discharge over a tidal cycle is positive than the water is transported in the ebb direction, if the netto discharge over a tidal cycle is negative than the water is transported in the flood direction. 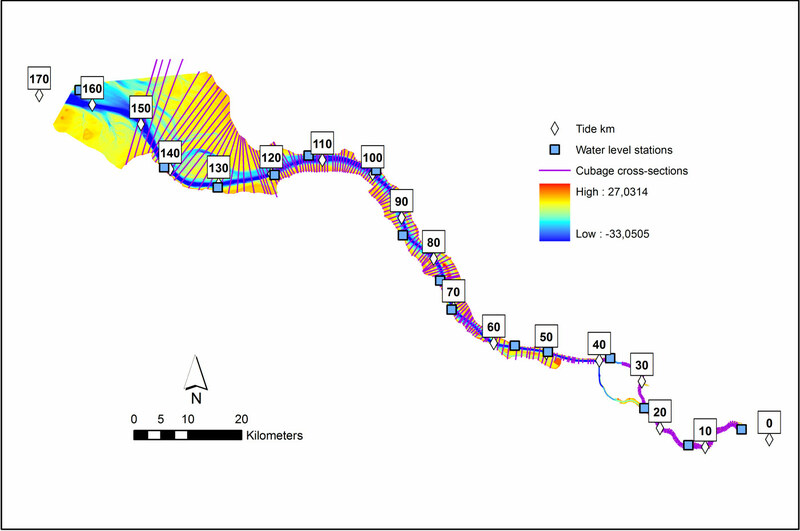 SPM values at the water level stations were derived by use of linear interpolation (SPM stations not at the same locations as the water level stations, see Figure 9 till Figure 12). Based on the available SPM data and calculated tidal discharges (see Table 5), sediment fluxes were calculated according to equation (3). The sediment fluxes in the flood direction are hereby positive and the sediment fluxes in the ebb direction are negative (see equation (3)). 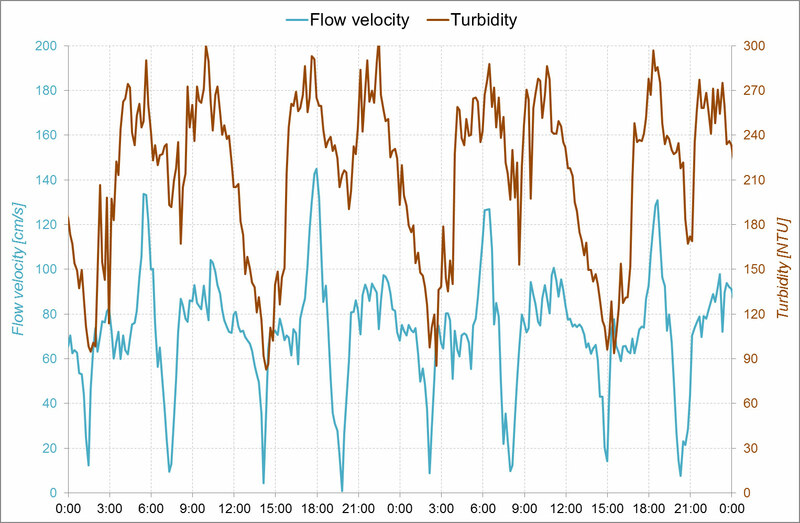 Sediment fluxes under mean riverine discharges for the Elbe, Weser and Humber were determined by averaging the calculated sediment fluxes under high and low riverine discharge. For each water level stations a netto sediment flux was calculated, as the sum of the different sediment fluxes per time step over a full tidal cycle. It should be mentioned that this methodology is only a simple approximation of the real sediment fluxes. The methodology uses a constant SPM over the tidal cycle (due to limited data availability), while in reality the SPM will vary strongly over a tidal cycle (Figure 6). Therefore the calculated fluxes should be seen as a first approximation that will be used in the evaluation of topic 3.